Published: Dec. 9, 2018 at 09:11 p.m.
New England Patriots quarterback Tom Brady tosses a touchdown pass to tight end Rob Gronkowski in triple-coverage. 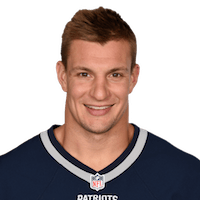 Published: Nov. 25, 2018 at 01:46 p.m.
New England Patriots tight end Rob Gronkowski makes contested 34-yard touchdown look routine. Published: Sept. 9, 2018 at 03:15 p.m.
New England Patriots quarterback Tom Brady throws a perfect ball to tight end Rob Gronkowski, who hauls it in for 30 yards.